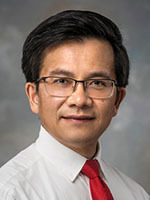 Dr. Qin earned his medical degree at West China University of Medical Sciences and completed Internal Medicine training and clinical fellowship training in Hepatology at West China Hospital. He also earned a PhD from Sichuan University. He practiced Internal Medicine for 10 years in China before he moved to the United States. Dr. Qin provides specialty care for patients with different kinds of kidney disorders including chronic kidney disease, acute kidney failure, kidney stones and high blood pressure (hypertension). He is board certified in Internal Medicine.